Schezwan Sauce/chutney is used to prepare many Indo Chinese dishes like Schezwan Fried rice, Schezwan noodles and other schezwan dishes. It comes very handy and you can make schezwan fried rice, noodles within 10-15 minutes. It is very flavorful and is easy to make at home. Today we will learn how to make schezwan sauce at home following this easy recipe with step wise pictures. Take a cup of water, add red chillies (seeds removed) and bring it to boil. When it starts boiling, simmer and cook for 5 minutes. Filter the water and grind the chillies with needed water. You can use the water in which the chillies were cooked for grinding. Heat oil, add garlic and saute for a few seconds. Then add ginger and saute both ginger and garlic together until light brown. Add chilli paste, soya sauce, tomato ketchup, sugar, salt needed and cook on medium flame until the sauce thickens and oozes out oil. Cool and store it in an airtight container in the refrigerator. It stays good for 2 weeks. Apart from preparing schezwan dishes, it can also be served as a side dish for momos, parathas and rotis. 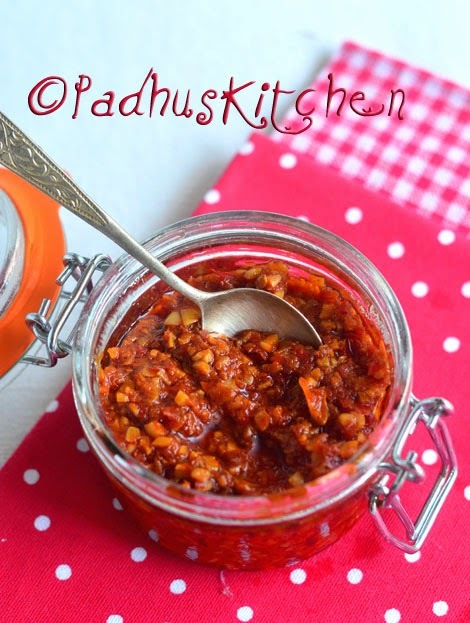 Try schezwan dosa using this chutney. If you have leftover rice and this chutney, you can make Schezwan Fried rice within 10 minutes. Simple and amazing taste! Thank u for this spicy recipe! Nice recipe.. Thanks .. was looking for the recipe long time.. If we add Indian Blackberry (Jamun) vinegar to it, will the taste be enhanced and will it stay preserved for a longer time period? Can i mix the ginger and garlic as paste together and then fry in oil ? You can try but I feel in this way, it adds some texture to the dish. Regular dry red chilli only. Can we add kashmiri chilli , but it tastes different, or can use byadgi Mirchi? You can use any chillies.